Another little outfit, originally uploaded by indiaeden. We are all home now for Easter, lots of DIY planned, and hopefully some gardening in the (hopefully) sunshine. 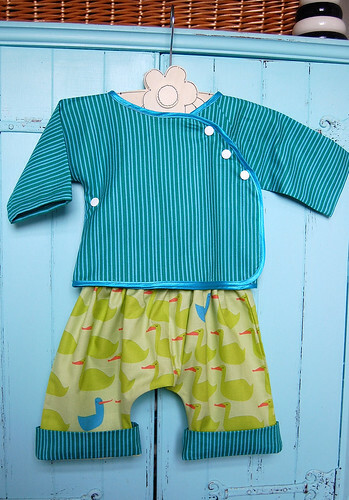 I ran up this little outfit for baby boy today. I used the Red Letter Day fabrics by Lizzy House. 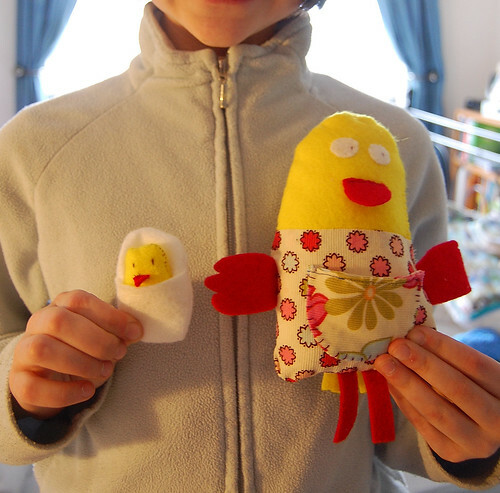 And Eden made this adorable Mama and Chick today after I spotted the tutorial on Whip Up this morning. She's done a really good job I think. We went to take Florence fresh flowers today and the cemetery was brim full of beautiful spring flowers, sadly though Florence has a new little neighbour. Lovely outfit & very sweet chicks! The flowers & shrubs look so pretty peeking through here when the sun puts in a rare appearance (and the rain is keeping the grass looking so lush & green). We love the chicks. I think she may follow in your footsteps. Oh, Hope is buried near another little stillborn baby. We couldn't get her in the children's section as it was full. How sad is that. I'm glad, in a very fucked up way, she has her little friend near by. Sally, it's so weird isn't it? Florence isn't in a baby section either, but in just the space of eight months there are three other babies near her. It breaks my heart. No more Alice Cooper eyes for me.